How Over Stimulating Baby During Playtime negatively affects your baby. Babies do not need a lot of action to be perfectly content and to learn from the world around them. As a first time mom with Brayden, my oldest, I thought my job was to make sure he was happily entertained every minute of the day. As he got older and I learned about and instituted independent playtime, I saw that not only was that not my job to entertain him every moment, but it wasn’t good for Bradyen for me to do that. Brayden was a highly overstimulated baby due in large part to my excellent entertaining skills. Once I started to back off, he chilled out. I had, however, trained him to need entertainment. When it came time for independent playtime, he had a rough go getting started. We had to start with 5 minutes and work our way up over time. He did get there, but it took time (read all about how to start Independent Playtime late here). When Kaitlyn came along, I was not the entertainer to her that I had been to Brayden. Part of the reason is that with a 22 month old child, I didn’t have the time available to me to entertain her like I had Brayden. But the main reason for it is that I had learned my lesson with Brayden. Babies don’t need the stimulation we need as adults in order to be entertained. Everything is new and interesting to a baby. It takes very little to teach and interest them. With Kaitlyn, I learned to just let her sit there. She could be in the room with me and be fully fascinated by the normal happenings of the household. I didn’t need to be constantly singing, touching, bouncing, performing, showing toys, etc. Kaitlyn was not an over-stimulated baby. She was content and happy. And in case you read that and worry that if you do the same your child will be less intelligent…Kaitlyn has been identified as gifted. My effort in not over stimulating her has not hurt her intelligence level. 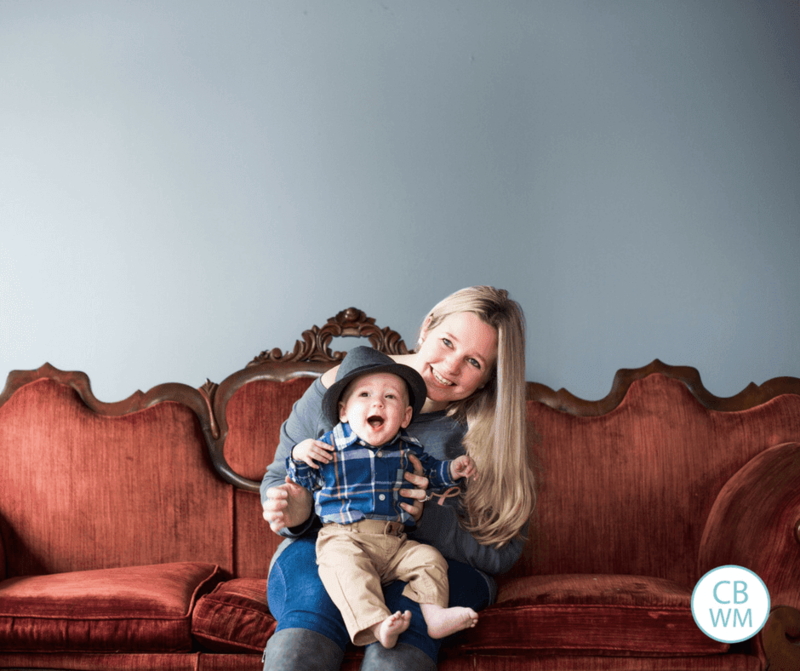 When we started independent playtime with Kaitlyn, it was easy. I put her in the playpen, expecting to have her cry or fuss for a full 5 minutes before I got her. Well, she happily played for 15 minutes before I decided that was long enough for her age and got her out. We have never had a problem with her and independent playtime. If your child is resisting Independent playtime, read what to do about it here. So no matter the age of your baby, try to provide proper stimulation for his needs. 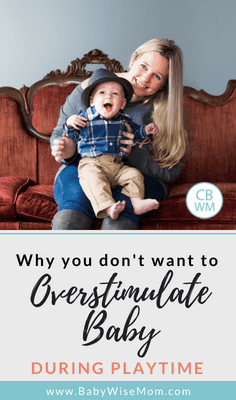 Over-stimulation is not going to do anyone any favors. If you find your baby has become overstimulated, take note of what waketime was like and adjust waketime activities in the future. Just because your child is awake doesn’t mean you need to be in front of his face putting on a show. Let him have some time to observe. Let him have time to himself. Realize that even a diaper change for a newborn is quite the stimulating activity. Take care to not overstimulate your baby. Previous Post What was/is baby’s approximate optimal waketime length for ages 6-8 Weeks? (waketime length includes feeding time)? Hello – I am new to this fantastic website. How rereshing to see a site dedicated to the benefits of babywise instead of the many out there that seem to tear it apart! I have a question for you…. We recently started our 4 1/2 month old daughter on cereal per her ped’s advice. She was taking about 40 ounces a day in formula and is just over 16 pounds now. She was taking 5 bottles a day – about 8 ounces each feeding. Her doctor said we should be doing 4 feedings now and introducing cereal. Well, we tried that and she hated the cereal part of the equation. She sleeps fine through the night (goes down at about 7:30-8:00 and wakes at 7:00) with the 4 bottles, but she is very “stubborn” when it comes to the cereal. Everyone has suggested putting it in her bottle (which I DO NOT want to do) to get her used to it. I want to stay consistent with her – so we have been trying it out 2 times every day. We get the same results: crying and pursing her mouth shut. I tried just plain baby food applesauce with her this morning and she seemed to like that a little better. Not thrilled with it by any means. Do you have any suggestions? Her ped also said to give her the normal bottle first – then 2 hours later, give her cereal. To me, that sounds like snacking. I have been doing 1/2 bottle, cereal, 1/2 bottle again as my routine. This morning I did the sauce and bottle following that. She seemed to eat quite a bit of the sauce (I guess, from what I could tell) but only took 5 ounces of formula (normally would take 8). My other concern is this: no matter what time we put her down for her 2nd nap of the day (usually around 1:00 – with the next meal at 3:00) she ALWAYS wakes up at 2:00. If she gets up, she gets fussy about 30 minutes later and wants to go back to sleep. Sometimes she will just stay awake until she eats again. Is it normal for her to kick out a nap on her own? I know the older she gets, the less naps she will take. Any advice would be super! Thank you!!!! Emily,I pumped in the morning. I nursed one side, and pumped the number of ounces I wanted from the other side–enough for the whole day. I then had Kaitlyn nurse from the side I had had pumped on. You really shouldn’t be able to get anything out if you try pumping right after baby nurses–baby is better than a pump and baby should completely drain one side before switching. I just came across this site – great info. Very helpful – thank you! I noticed my 2-month old often has a hard time falling asleep when nap time comes or nap longer than 45 mins when she's over-stimulated. I just spent 2 hours putting her to nap and when she woke up 45 mins later, I fed her. But instead of playing with her, I noticed she still exhibited tireness, so I rocked her to nap again. My question is if their nap was delayed due to over-stimulation, once they wake up, should we put them back to sleep again or follow the feed / play schedule? Also, the reason why I rocked her to sleep is because when I let her CIO, she cried so hard that she began to choke on her saliva. For fear of something happening, I picked her up. Did I do the right thing? Thank you very much! Linda, When they are overstimulated, I think it is the right thing to help them sleep as you did. It isn't fair to expect them to fall asleep on their own when they are so wound up. As they get older, they will be able to fall asleep better on without help–even when overstimulated.For a baby that age, I would have fed as soon as she woke, too, to keep the feeding schedule. My son is almost 2 weeks old and I'm doing my best to implement BW from the start. Is it necessary to have wake/sleep time between every feeding? My question comes in the evening… if I am trying to cluster feed, there is only 2 hours or so between feedings. His feedings can take up to an hour, so that leaves little time for additional wake time and then he fights to nap. Also, how long should his wake times be? If I am striving for 50-60 min or so, that is pretty much consumed by his feeding time. So during the day I feel like I am feeding him and immediately putting him back down. Is this right? I feel like I am not getting any good wake time in for fear of over stimulating him and him not napping. Help? As a newborn, very short waketime or basically none is very common. See the posts on optimal waketime for more on that.In cluster feeding, you don't necessarily need sleep between for all ages, but a 2-4 week old can't really stay up for over two hours and then sleep well after that. I love your last sentence. My LO was completely enthralled with his diaper changes for about 6 months! He loved them. If he was ever grumpy-we would just take him to his changing table and he was instantly happy. It was hilarious.I have a question on stimulation-my LO (7 months) is at a sitters with about 2-4 kids. This is probably the reason he doesn't get good naps during the day. I can't see anything I can do to decrease stimulation since it's her home and other kids are around. Any thoughts?? Did you ever get an answer to your question? I'd love to know how you handled the situation. Hi Val, I just wanted to comment and say thanks for a great blog. I have a nearly-5w-old daughter and I'm a first time mum with no baby experience. A very good friend bought me Babywise and said it was her bible with her baby. I loved the philosophies and have been implementing them in a flexible (Parent-directed (-;) manner. Alexis has been sleeping well through the night since we arrived home, with just a single 2/3am feed.I had been having some issues with my day naps, particularly the further through the day we got. Yesterday she totally lost the plot on nap 3 and was inconsolable until I finally got her to nap on my chest (after a brief stint in her swing). Anyway, even though I had been monitoring her for tired signs I think I very much missed them and had overstimulated her. Today I kept playtime more independent and was suprised when she yawned and had a little grizzle after only 5 mins! (following nappy change, feed and burp which took around 50 mins). So I picked her up and cuddled her, and after a very small amount of fussing she fell asleep (on my chest again, but a lot faster and NOT inconsolable, and her prior naps had been in the bassinet). So, thank you. I had no idea how little it takes to overstimulate them. I hope I'm not just having a good day! (Every time I think I'm getting it sorted, she changes the goal posts! )I know you also have a new LO, so don't feel you need to comment back, I just wanted to share.